The Sales Professional Platinum Package resource is a must-have for any sales professional. 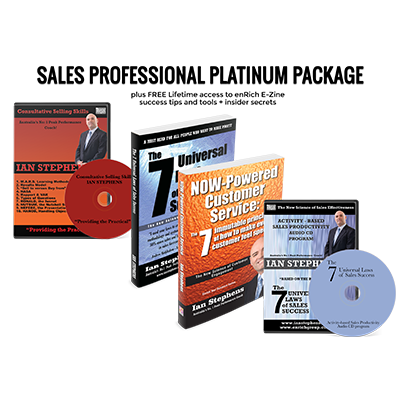 It includes Ian’s Book ‘The 7 Step Universal Laws of Sales Success‘, his 45 minute audio mp3 ‘Activity-Based Sales Productivity‘ where Ian is interviewed about the sales laws and tools, a downloadable mp3 of Ian introducing you to his Consultative Selling Skills & tools, and his latest book ‘NOW-Powered Customer Service‘. 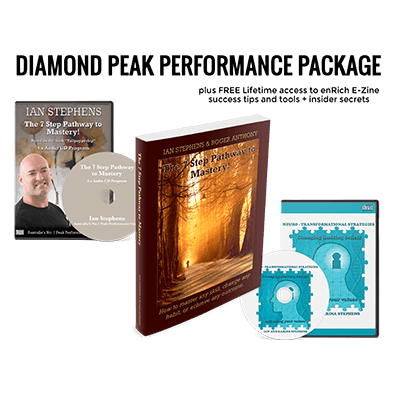 The Sales Professional Platinum Package resource is a must-have for any sales professional. 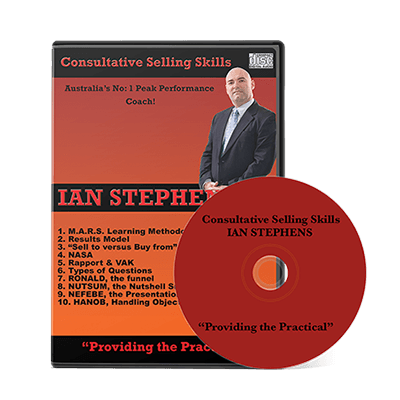 It includes Ian’s Book ‘The 7 Step Universal Laws of Sales Success‘, his 45 minute audio mp3 ‘Activity-Based Sales Productivity‘ where Ian is interviewed about the sales laws and tools, a downloadable mp3 of Ian’s Consultative Selling Skills audio program, and his latest book ‘NOW-Powered Customer Service‘. 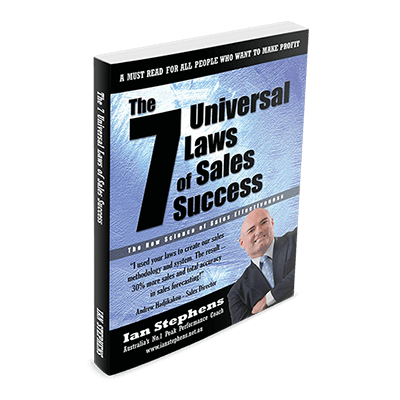 Learn the 7 universal laws which underpin peak performance in any sales role, know exactly how much activity is required to nail your sales targets and be proactive in finding new clients, securing your pipeline and growing existing clients. Understand how to build dynamite rapport with anyone – fast! Grasp the key laws which underpin providing great customer service, creating raving fans and get on-going repeat business.